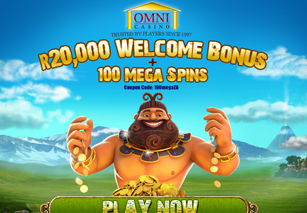 Omni Casino has been online since 1997 making it one of the oldest and most respected brands in the industry. It is owned by Peak Interactive N.V. and is fully licensed and regulated in Curacao. Its random number generator is audited by Technical Systems Testing for fairness and it employs multiple methods to ensure the security of your personal and financial information. Stepping into Omni Casino's Playtech powered casino lobby is like joining a giant games arcade. With over 160 top titles available at your fingertips in download or instant play Flash version, there is never a dull moment at Omni Casino. The site offers six variations of blackjack, eight variations of roulette, casino hold'em, craps, 13 variations of video poker, mahjong, keno, arcade games and more. The star of the games collection is undoubtedly the slots category which includes popular titles such as MGM branded games and Marvel hero slots, as well as eye-watering progressive slots games. If you sign up for a real money account you can claim a R20,000 Welcome Bonus + 100 Mega Free Spins. If you make a deposit using an alternative payment method, you will be eligible for an additional 10% deposit bonus. We noted that this site regularly runs slots tournaments, so keep an eye out for the next big tournament to begin. Loyal players take note: Club O is a three-level VIP program that offers multiple benefits and rewards to its members. The higher you climb in the program, the more benefits you will be eligible for. Benefits include deposit specials, free play offers, special tournaments, exclusive promotions, higher deposit limits, special events, birthday offers, cash back, higher game limits and more. You can also earn comp points which can later be redeemed for cash. If you have any questions when playing at Omni Casino you can access the FAQ section on their website. If you do not find the answer you are looking for, you can contact a customer service representative 24 hours a day, seven days a week. They can be contacted via email, telephone or instant live chat.